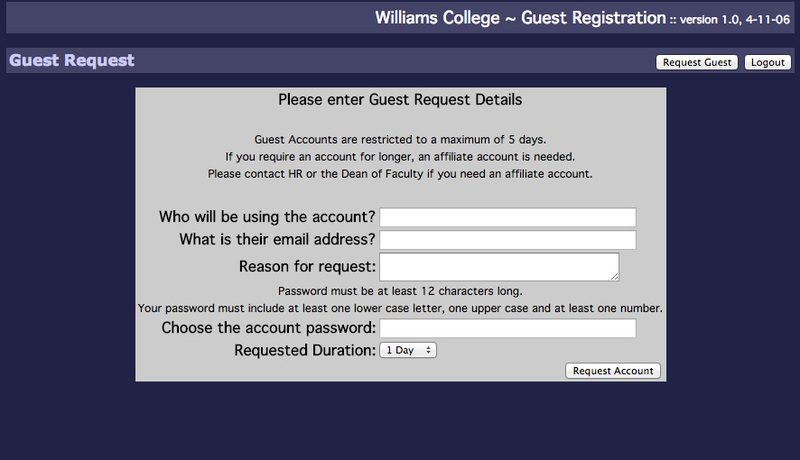 Temporary guest accounts are available for request by Williams faculty and staff. 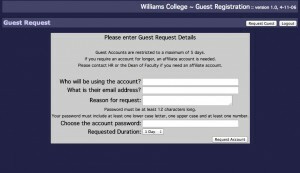 These accounts can be assigned to short-term campus visitors, guest lecturers, contractors or anyone who is here doing official business and needs to be able to log into the lab/classroom computers or other Williams password protected systems. Also, if all a person needs is access to the wireless network, see our Guest Wireless network access page. As requester, you will need to authenticate to access the page. Complete the request by clicking on “Request Account”. When done you can give the username which will be something like “Guestxx” and the password to your guest.